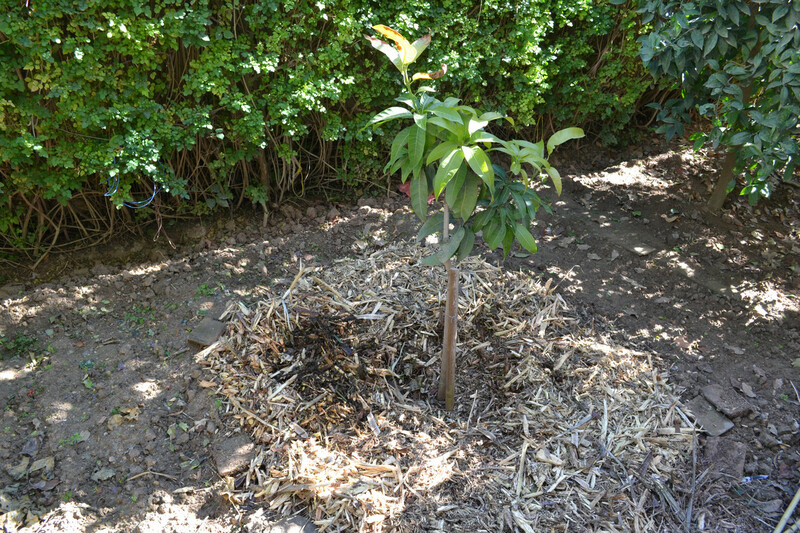 Hi guys, how thick can one go regarding woodchips under a mango tree? 8 inches is too much? The soil 3 feet around the tree is clay but has been mulched for the past two years and the texture is already improved compared to the surrounding soil. Mango or not, I would say 8 inches is at least 4 inches too much. The roots need air, 8 inches would tend to greatly restrict that in my opinion/experience. I got woodchip-happy once and i paid the price. In my opinion, you want only as much mulch as it takes to suppress weeds and retain some moisture in the soil (depending on your conditions/rainfall/irrigation). Too much mulch is definitely a risk, as is too little (for young plants in hot/dry conditions especially). It looks like your amount is right, but you should expand the diameter every year, as much as you want for diameter, always beyond the drip line to keep improving soil. Eventually the tree will provide its own shade and only the outer edge will ned something. You might try a different type mulch from time to time. Maybe use leaves, then straw, then horse bedding, rakings from under bamboo, coffee grounds, compost. By changing the source of mulch you may be adding diversity. I’m not sure of your water situation. Plant benefiting microbial life mostly reside in grass plant roots, I see a lot of bare earth which needs to be covered with something. A living mulch comprised of a biodiverse mix of grass, weeds, flowers vegetable will provide a green path for microbial life that will greatly benefit your tree, the soil quality and your soils water holding capacity. I feed my living mulch in the trees perimeter, periodically with very very small amounts (5-20lbs.) of a variety of carbon; raw manure, compost, woodchips, palm fronds, tree limbs, etc. and try to spray my entire farm every other week with a Biodynamic compost tea. Here in Florida I don’t water any Mango trees. I used about 10 times more than that with beneficial results. I would mulch all of the bare earth and just pull it away from the trunk. I have mulched 40 cm deep with great results. I like to pee outside and bury food scraps under the mulch. It is even better if you grind it up in a blender first. The amazing thing is how fast the mulch breaks down. I add fresh mulch 2-3 times a year, after a couple months it is gone. You could go much heavier on the mulch so long as the mulch isn't right up against the trunk. It will break down quickly (especially with moisture). Periodically checking your tree's moisture level can be important when stacking up the mulch (depending on soil type). Thank you all for your inputs. Regarding renewing the woodchips, do you wait till it is fully decomposed as it is advised in the net or do you replenish to keep the thickeness if the mulch inchanged?